Luxury Marigot Bay Marina Apartment (seen on TV) includes 5* Resort facilities! Welcome to our beautiful, spacious one bedroomed apartment in the heart of Marigot Bay, regarded by many as the most beautiful bay in the whole Caribbean! Watch the million dollar super yachts sail into the stunning Marina from your balcony, relax on the nearby picturesque beach or enjoy exclusive access to the pools, bars and restaurants of the Capella Resort, right next door. The apartment is in the heart of the beautiful Marina Village, a picturesque collection of 7 buildings, built in a Colonial style in pretty pastel shades around a central courtyard, looking out across the bay. There was no doubt in our mind that this was a beautiful apartment in a stunning location and there was the added bonus that access to the luxury Capella Resort next door was included! Five star facilities, gorgeous location and a lovely apartment, we were sold! We hope you will be too, when you stay here. The apartment is fully appointed with a designer Italian kitchen, en-suite bathroom and a tranquil bedroom featuring a lovely four poster bed. The whole apartment has been decorated and furnished to the highest standard, ready for our guests to enjoy. The whole interior has been redecorated in crisp white to maximise light and with new furniture, drapes and rugs throughout. The bedroom features new drapes and bedding in warm, earthy tones to compliment the tropical hardwood four poster bed, bedside tables, dressing table and has garden views through the double windows. The living area features two comfortable sofas in nautical colors (soft blues and whites) perfectly suited to its Marina setting. There are quirky side tables and nautical themed features throughout, plus many original artworks. The living room also features new drapes and rugs, to create a homely but luxurious ambience. The balcony also features new furniture. The Capella Resort is a five star luxury resort and is right next door. Guests staying in our lovely apartment have full use of the facilities of the Capella Resort included! Centrally located to explore all that St Lucia has to offer, but you may find that you never want to leave! You can find more information and photographs of the apartment, the Capella Resort and the Marigot Bay region on our website. Search for "Apartment 5A Marigot Bay' and it will be on the first page of results. Look for a site with "a place in the sun st lucia" as its title. We applied to be on the British TV show, "A Place in the Sun" (known as "House Hunters International" in the United States) as we love the Caribbean, having visited it many times over the years. After viewing dozens and dozens of properties on the internet, we hoped that the TV show would find us that "special place". We hope anyone who stays in our apartment will agree they exceeded expectations! Boutique hotel style bathroom with walk in shower, glass hand basin with granite counter tops and low level toilet. Double windows with views over the tropical gardens of the Capella Resort. The apartment is in the heart of the Marina Village, looking out across the bay and close to the water's edge! The apartment looks out onto the Marina and has excellent views of yachts passing through. There is ample car parking just a one minute walk from the apartment. The apartment has full wi-fi. Yes, Beach towels are also provided! All plates, dishes, flatware, cooking utensils, etc are provided. Designer Italian kitchen with generous counter tops, fridge freezer, single oven and 4 burner hotplate. Microwave, dishwasher, washing machine, drier. Table big enough to seat four people, open the four balcony doors completely to bring the outdoors inside, or eat on the balcony! The tropical gardens of the Capella Resort are free to use by our guests. The generous balcony has views through the courtyard to the Marina and Bay beyond. Two pools available. The main pool has a swim up bar, fountains and four poster day beds. The infinity pool is fed by a 10 foot high waterfall and has views over the Marina and Bay. We enjoyed a very relaxing and enjoyable week stay at Marigot Bay. We split our days on the beach, at the Capella pool, and on day trips via boat visiting other bays and snorkeling. There were plenty of choices for dining in the area. Some you could walk to and some by water taxi but all less than 5 minutes away. The condo was very quiet, comfortable and easily assessable. The only caution I would give is the electricity is not 110 like it is in the states, although an adapter was provided. We especially liked watching the boats that would come in the bay and stay for a few days and the sunsets were like we’ve never seen before, absolutely gorgeous! Plenty to do to keep you entertained at night as well, Piton is the local beer. We found the people there very friendly and willing to help make our stay enjoyable. All spoke perfect English. Land taxi’s and water taxi’s were on hand to take you wherever you wanted to go. A special shout out to Tom who cooked us a lobster meal on the beach as well as served us several “coco loco’s” with Marigot’s own coconut rum. Yes we had a great time and would definitely consider a return trip. Highly recommend! Best location! The pictures are true to the condo! My husband and I just returned from an 11 night stay in this condo. I feel the location is the best to stay on the island. The condo is just like the pictures. Very clean, beautiful and relaxing. Had everything we needed & more. We enjoyed the balcony every morning where we had coffee. It was also nice to sit on the balcony, enjoy a cocktail and not get wet when it rained. The use of the resort next door is a plus! They come around with free coconut water in coconuts while at the pool. :) Music and dancing in the evening while enjoying dinner. I have a bad back and the bed was comfortable. The store downstairs had the necessities we needed. The Indian restaurant across from the unit was one of our favorite places to eat. They were very kind to us and made us chicken soup & a special tea as we both caught a slight cold. 1. Renting a dinghy at the beach for $50.00 U.S an hour. We enjoyed two hours and went to places along the coast line we were unable to get to by car. Took great pictures. 2. Renting paddle boards at the beach. 3. Enjoy a whole day at the beach. Doolittles - eat lunch and dinner, use the pool there, play billiards and listen to music into the night while watching the sunset. 4. Pigeon Island for the day. Climbed to the top of the fort. Great views for taking pictures. Have lunch there. 5. Visit Rodney Bay. Walk the marina and have lunch with great views. Duty free shop. 6. Have a cocktail at DJ’s which is a ferry ride across in the corner of the bay. Watch the yachts come in and the sunset! 7. Have lunch or dinner at Mangos and watch the sunset. 9. Take a walk up the hill every morning for some good exercise & great pictures. 10. Rent a car and take a slow drive along the coastline. The island is beautiful and the people are great. I would not recommend driving at night!!! We would highly recommend this unit! We thoroughly enjoyed our one week stay. It was perfectly located near the resort, the marina and the restaurants. Thank you Cliff. Thank you Pauline for your help. This apartment is exactly as shown on the site. Very nicely decorated and has everything you need for your stay. Booking on the HomeAway site was secure and easy. The owner Cliff was always quick to respond to any inquiries about the property and the area. It was a comfort having the property manager meet us upon arrival at the apartment and was very helpful in arranging taxi services for us. No need for any extra utility fees and security deposit was returned in a timely manner. 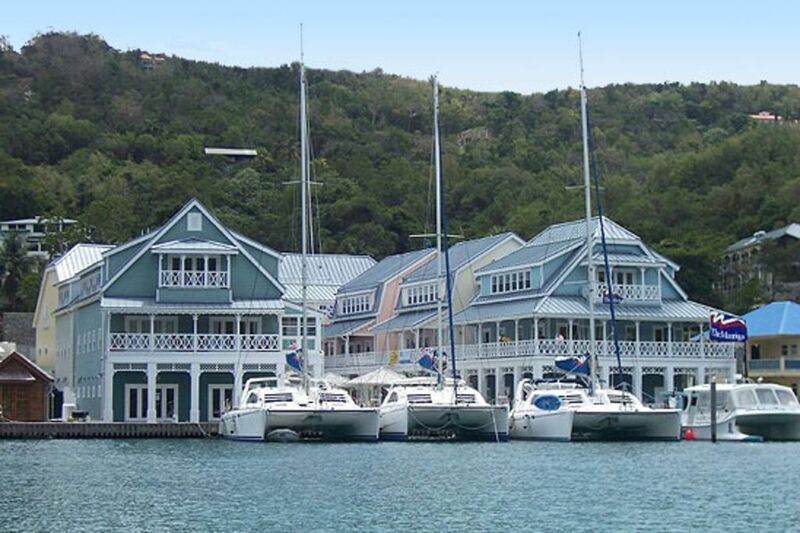 You can feel safe at Marigot Bay and Marina Village. The resort directly next door is a simple two- minute walk away along the bay. Formerly Capella Resort now named Marigot Bay It has two beautiful pools for you to enjoy. Absolutely beautiful boats and yachts coming and going in the bay. We did venture across the bay to the beach to go on a kayaking tour. This was one of the highlights of our trip. A couple hours long. Very enjoyable and excellent guide. We ventured out on our last evening to have dinner across the bay at Hassy's restaurant. This is a very small outdoor patio type restaurant across the bay. My husband and I shared a pizza which was very good and a couple of drinks and really enjoyed just relaxing and looking at all the lights in the bay at night. Price for dinner and drinks was very reasonable. We were on vacation to attend a destination wedding at one of the high-end resorts. We went to the resort for a full day on the day of the wedding. I would stay at this apartment before ever deciding to stay in a resort. You have so many affordable restaurants available to you, use of the Marigot Bay resort, grocery store, etc all at your fingertips. Having our own breakfast and coffee on the balcony each day was far better than going to a cafeteria at a resort. Groceries are much more expensive in St. Lucia than at home (Canada|) but you can bring in anything other than fresh meat, fruit and produce. Crazy as it sounds, we checked a bag with just groceries purchased from home including a cooler with milk and cheeses. Worked out great for us. We also visited the Massey grocery store just 10 minutes outside of the Marine Village for some additional items on our way in from the airport. The apartment has everything you need to prepare whatever meals you want. Trust the reviews. This apartment and area deserve all five stars. If we ever return to St. Lucia this will be my first choice for accommodations. Beuatiful apartment and great location! We loved staying at Cliff's apartment in Marigot Bay. Large, spacious apartment with outdoor balcony. Access to Capella resort amenities. Highly recommend! Beautiful apartment on the harbour. Very spacious. Well equipped. Lovely agent Pauline looked after us. The apartment is in the heart of the stunning Marigot Bay, right in the Marina Village, next to all the million dollar super yachts. Conveniently located to explore all that St Lucia has to offer, from the Pitons, volcano and mudbaths to the south or north to the Rodney Bay area and Castries, including the world famous market. $300 deposit required at time of booking (£200 for UK guests), balance due 60 days before arrival. There is also a security deposit of $300 (£200 for UK guests), refunded 14 days after departure (subject to no breakages or damage) Please note, as St Lucia is an island, resources such as electricity and water can be very expensive. As property owners we urge our guests to use electricity and water responsibly. Please do not use the air conditioning when doors or windows are open. (There are numerous ceiling fans to provide a breeze when the apartment is open to the outside.) Please do not leave the air-con running when the apartment is unoccupied, this is very wasteful and can result in a very expensive electricity bill. We allow a very generous 30 units of electricity per day. (As an example, during a recent stay, we averaged 10 units per day, which was a mixture of air-con, fans and washing machine use) If guests electricity usage exceeds 30 units per day average (which is a very generous allowance) the excess may be deducted from the security deposit. Thank you.